The Platform sits flush with the worksurface and works fine for the corner. The radius figures into whether you will be able to raise the keyboard tray up to level with the desk top. It can fit on the corner and it swivels in a complete 360. Our most popular combination, the Solution 2CC allows the keyboard platform to sit flush with the work surface. The platform can also be adjusted from 2.5″ above the work surface to 4.5″ inches below. Shop with Confidence: ESI products are built to exacting standards and out of the highest quality materials to withstand the rigors of daily usage making them the perfect solution for the office or home. 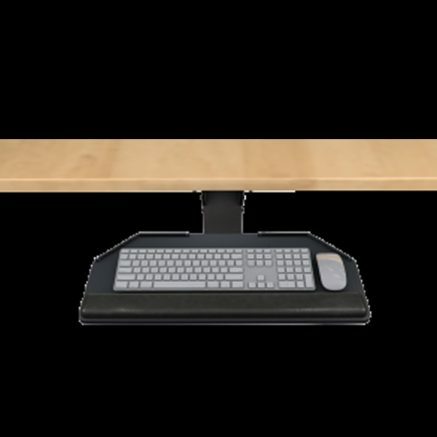 PL003CC keyboard platform is a cut corner 25″ rectangle which accommodates both the keyboard and the mouse on the same level. The PL003 includes a single detachable palm rest for left or right-handed mousing, mouse pads, mouse guards, and cord management clips. It is best used on straight edge and 17″ (or larger) diagonal work surfaces. 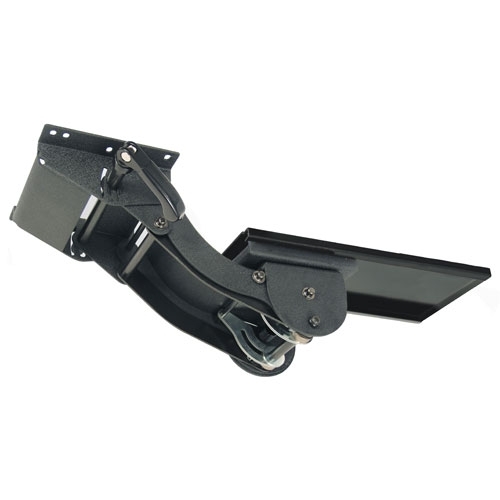 The patented arms feature a 7″ height range and an ergonomic tilt handle. 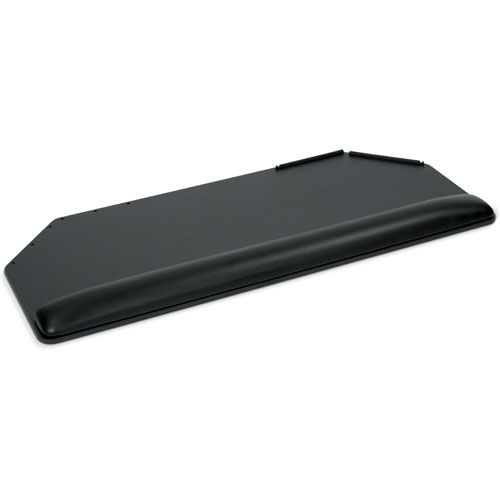 The neck is specially-designed to allow the platform to be placed flush with the surface of the desk or table. A single part number is all you need for a complete system. All Combo Solutions like the Solution 2CC include a keyboard platform, articulating arm, leatherette-covered gel palm rest(s), nonslip pads, mouse pad, mouse guards, and cord management clips at no extra charge. Users have the ability to adjust the keyboard placement for maximum comfort with ESI’s wide range of keyboard solutions. All keyboard solutions are also available in R-series material which is composed of 100% post-consumer materials, making them completely recyclable. Available in R-Series. Call Customer Service for details. The R-Series platforms are composed of 100% post-consumer materials, making them completely recyclable. They are free of formaldehydes and carcinogens and emit no VOC’s (Volatile Organic Compounds).